Broncos fans are relatively divided over whether firing Mike Shanahan was the right thing to do, Public Policy Polling's newest survey finds, but they're also pretty supportive of the hiring of Josh McDaniels. 43% of self described Broncos fans surveyed supported firing Shanahan, with 31% opposed. 48% of fans approve of the hiring of Josh McDaniels with only 10% disapproving and 42% still unsure. A roughly 5:1 approval rating for a newly hired football coach is pretty darn good. It's worth noting that even among fans who disagreed with the decision to fire Shanahan, McDaniels gets pretty good marks with 44% approving of the hire and 16% in opposition. Perhaps not surprisingly, the Broncos' youngest fans are most supportive of one of the youngest coaches in NFL history, with 67% of them approving of the hiring and only 9% unhappy with it. It is also perhaps worth noting that the 42% of respondents unsure what to think of McDaniels is lower than the 45% of voters in our poll released earlier this week who didn't have an opinion about new Senator Michael Bennet. Pat Bowlen had to make some tough decisions over the last five weeks but it appears he has the team's fan base mostly behind the choices he made. According to the exit polls, voters under 30 were more supportive of Barack Obama than those over 65 in every single state. There was a wide disparity among the states though in terms of the size of the generation gap between young voters and senior citizens, ranging from just five points in Georgia to a high of 66 points in Ohio. Four of the six states where that disparity hit 49 points or more were among the most hotly contested battlegrounds of the 2008 election. They all went blue this year and given the huge difference in voting patterns along generational lines in each of them, they could go from purple to blue in another few decades as the more conservative voters age out. Here’s a look at Ohio, North Carolina, Indiana, and Nevada. Barack Obama took the Buckeye state by a little under five points. He lost by 11 points with voters over 65 but won by a staggering 55 with those under 30. It’s not surprising that senior citizens gave McCain a double digit victory in the state. Since 1976 the Republican candidate for President has done better in Ohio than he did in the popular vote nationally in every election except 2004, when John Kerry’s margin of defeat in the state was three tenths of a point less than it was on a national basis. As that reliably Republican demographic ages out and these younger, considerably more Democratic voters become a larger segment of the state’s electorate it could become a more solidly blue state. One caveat though: Ohio has one of the slower growth rates in the country and if these young voters move out of the state in disproportionate numbers it could slow the state’s political transformation. The Tar Heel state provided Barack Obama’s narrowest victory in the country, and young voters had a lot to do with it. He racked up a 48 point victory with that demographic while losing senior citizens by 13 points for an overall generational disparity of 61 points. North Carolina, like Ohio, has tended to vote a good deal more Republican than the nation as a whole. Since 1964 its Presidential vote has come down that way every time except 1976 and 1980 when the state gave a higher level of support to Jimmy Carter from the neighboring state of Georgia than he received nationally. In migration is helping to fuel the blueward trend in the state. A PPP study conducted last August found there was a 13 point difference in the Presidential margin between voters who were born in North Carolina and those who were not, with the newcomers going strongly for the Democrat. There’s no reason to believe the population expansion in the state is going to stop any time soon, and at this point it’s moving the state in a more progressive direction. The voters who put Jesse Helms into office time and time again are being replaced in the electorate by these much more progressive younger voters. They put Obama over the top this year, and they could have the state wearing a darker shade of blue by the 20s or 30s. An 80 year old person in Indiana may have cast their first vote for President in 1952. That generation of voters in the state has been exceedingly Republican. In every single election over the last 56 years the state has given a higher percentage of its vote to the GOP candidate than he received in the nation as a whole, and in all but a few of those contests the Republican has run at least ten points better in Indiana than in the national popular vote. Those older votes who have made the state deep red time and time again still delivered for John McCain this year, giving him their votes by a 24 point margin. But the segment of the electorate under the age of 30 gave Barack Obama its vote by an even wider 28 point spread. In 2006 the state saw major gains for Democrats in its Congressional delegation, and in 2008 the new generation of voters gave Barack Obama a surprising victory in the state. The Democratic trend of younger voters in the state and the aging of the most consistently Republican ones has the potential to make Democratic Presidential victories in the future more of a regular thing than the novelty it was last year. Nevada saw one of the largest movements in the country between 2004 and 2008, going from voting for George W. Bush to not only electing Barack Obama, but giving him a surprisingly high 12 point margin of victory. Although the state did vote for Bill Clinton twice, he didn’t earn better than 44% of the vote either time and other than those two instances it had not voted Democratic since the Johnson landslide of 1964. The older voters who helped make it such a consistently Republican state over the years voted that way again in 2008, giving John McCain their vote by 13 points. Younger voters in the state, however, went for Obama by 13 points. The Democratic youth movement is also being fueled by the increase in the state’s Hispanic vote. Even just from 2004 to 2008 their share of the electorate increased from 10% to 15%, and last year they gave their votes to Obama by a 76-22 margin. It seems safe to say it won’t be another 44 years before a Democrat gets over 50% of the vote in the state. The right kind of visibility? Ryan Beckwith notes this morning that Richard Burr has been stepping up his visibility in recent days. That's something he certainly needs to do with multiple polling companies showing that a plurality of North Carolina voters don't have an opinion of him. But is railing against politically popular programs like SCHIP and the stimulus the kind of visibility that's going to help build up his numbers? A poll we conducted in October 2007 showed 60% of North Carolinians in support of SCHIP. There was quite a division along party lines, with 87% of Democrats in support and 66% of Republicans opposed. 62% of independents were supportive. There's not been any publicly released North Carolina specific polling on the stimulus that I'm aware of but as Mark Blumenthal pointed out this week, no matter how you word it more Americans support it than are opposed. I don't see any reason why the numbers would be different here. I guess by opposing these programs Burr is appealing to the base, but no matter how much Republicans may try to ascribe their losses last year to disaffected conservatives staying home because the party 'lost its roots,' the reality is that there are a lot more Democrats than Republicans in the state right now. No Republican is going to win statewide without securing a good number of votes from Democrats and independents, and as long as Burr just keeps on toeing the party line on everything he's not going to give them much of a reason to cross over and support him. I've had several people ask me when we're going to do a poll seeing how Roy Cooper and Heath Shuler would do against each other in a primary. The answer, I hope, is never. It's really hard for me to imagine the two of them both running for the seat. Each has a perfectly good gig now that they can keep for as long as they want. With some exceptions, losing in the primary isn't usually very good for your future career. I would imagine if Cooper wants to be the nominee, he's going to be the nominee. Some other folks might run in the primary, like happened against Kay Hagan last year, but I don't imagine anyone of much stature who could run a particularly strong campaign doing that. If Cooper passes, it seems like it would be Shuler's for the taking. But I'd be very surprised if they didn't resolve this between themselves, so we won't be doing any polling on that unless it somehow becomes a reality. We'll test a third candidate against Richard Burr in February and I'll post a thread for your suggestions closer to the time. We're due for an update, but when the bill banning smoking in restaurants was up in the General Assembly two years ago we found that 67% of voters supported it. There wasn't much of a partisan divide on it either, with 68% of Democrats and 63% of Republicans in support. I think our friends at Civitas know there's no way they can word a poll question to get the voters of the state to oppose the smoking ban because instead of asking about that on their poll this month they asked a question about whether a bill should be passed allowing restaurants to determine their own smoking policies. That's fine, but the House Majority Leader is not vigorously pushing such a bill and when it comes down to whether the voters of the state support his proposal, they do by a wide margin. Elon found the same thing two years ago. All that said, I went to the Civitas luncheon today and appreciated their fine hospitality and entertaining program. I'll have some more thoughts on their findings later. I am excited for our first Virginia Democratic primary poll, which we'll conduct over the weekend and probably release on Tuesday. One thing that we're going to do is break down the results by whether respondents are natives of Virginia or not. I'm very interested to see if attitudes toward Terry McAuliffe differ significantly along those lines. It would not be surprising to find that his fellow transplants are much more open to his candidacy than natives of the state. When we broke down a poll this way last August we found that 49% of Virginia Democrats were not born in the state, so it is certainly a significant constituency. We'll also be interested to see if McAuliffe's early television push in the Hampton Roads area is paying any dividends. It's a logical place to start his advertising campaign since neither he, Creigh Deeds, or Brian Moran has a natural base there. It didn't take long for the media campaigns to start making a big difference in the Democratic primary for Governor of North Carolina last year, even at a similarly early stage in the campaign. If McAuliffe is already seeing his numbers rise there it could be an indication that his spending ability may make it tough for his opponents to compete. While PPP, Gallup, and 2008 exit polls show disparate party identification breakdowns for most states in the country, the one where all three organizations converge is North Carolina with a finding that there are 11% more voters who identify themselves as Democrats than Republicans in the state. A full discussion of the party id issue here. In 2004 exit polls actually showed a 1% Republican party identification advantage in the state, so this is quite a shift over the last four years. Based on the current registration numbers in the state Democrats have a 14 point advantage, with 46% of voters in the state registered as Democrats and 32% as Republicans. The reason the identification advantage is narrower is that many voters who have been registered as Democrats since the 60s or 70s may actually be more likely to vote Republican now, particularly at the federal level, but have not bothered changing their official registration. Gallup has some fascinating new state level party id data out today, but at the end of the day it just reminds me that party id is somewhat of a nebulous thing where there are no clear answers, and that even data as rigorously compiled as what they released today still does not provide any clear 'answers' as to the real party breakdown of the electorate in a particular state. Background: one of the toughest decisions PPP had to make in conducting its polls last year was whether to weight for party id. Ultimately we decided not to. The main reason was that we really weren't sure, if we did weight for party id, what numbers we should be using. 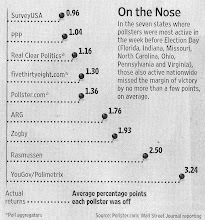 Should we use past exit polls? The most recent Gallup data? The most recent Pew data? What if party id shifted back and forth over the course of the year in relation to various events? Weighting to an out of date or incorrect party id target in a particular state could foul up an otherwise well conducted poll. Ultimately we decided just to weight for gender, race, and age and let party id fall where it fell and given that a Wall Street Journal analysis of swing state pollsters soon after the election showed us as one of the two most accurate in the country I don't regret it. It was a decision we took some flak for, particularly from Republicans, because the party id breakdowns our polls found tended to be much more Democratic than what the exit polls showed even for the very Democratic year of 2006. I have a feeling Democrats in the next few years may use the Gallup data to criticize our polls for being too Republican in their party breakdowns. Our polls in these states were pretty much right. The exit polls get to adjust their numbers to fit the final outcome so they're certainly right. And Gallup's research was very rigorous. Nevertheless there are major disparities in the party id breakdown the three organizations find in every state except North Carolina, Virginia, and New Mexico. Those differences are particularly large in states like Indiana, where there was a 14 point difference between the findings of Gallup and the exit polls, Ohio, where there was a 12 point difference between Gallup and what both PPP and the exit polls found, and Colorado, where again there was a 12 point difference between Gallup and the exit polls. Nate Silver has correctly pointed to a few of the reasons the Gallup numbers are so Democratic. While the exit polls were surveying actual voters and we were surveying likely voters, they were just talking to adults in general. Also, they prodded independents to say they leaned toward a particular party, which in last year's political climate meant more respondents identifying as Democrats. Still, those small differences in methodology don't explain some of the huge differences the organizations here found for party id in particular states. I don't think any of the companies here is necessarily right or wrong- the truth is that when it comes to party id, particularly at the state level, there is no 'correct' black and white answer. And even if there was, it might be different six months from now. Bill Ritter's taken a bit of a hit with Hispanic voters since choosing Michael Bennet to replace Ken Salazar rather than appointing another Hispanic to take his place. Our newest poll finds Ritter's approval rating at 47/40. That +7 net approval rating is a drop from when it was +13 at 49/36 in mid-December shortly after it was announced Salazar would become Interior Secretary. Almost all the downward movement for Ritter since that time has come with Hispanics. Where before the Bennet appointment his approval with that group was 54/30, it's now slightly negative at 44/48. He may have some fence mending to do there. A PPP survey in December had shown that 50% of Hispanics in the state wanted either Federico Pena or John Salazar to be appointed as Ken Salazar's replacement. Overall Ritter's approval rating with voters who hold an unfavorable opinion of Bennet is just 8%. In a hypothetical rematch with 2006 opponent Bob Beauprez, Ritter leads 46-40, an outcome much closer than Ritter's 57-40 victory the first time around. That's in spite of the fact that Beauprez is not viewed at all positively by most voters in the state, with 45% holding an unfavorable opinion of him compared to only 31% who have a favorable opinion of him. Beauprez leads Ritter 50-36 with the usually reliably Democratic Hispanic demographic in that contest. Ritter has a much more comfortable lead, 52-38, in a possible contest against former Congressman Tom Tancredo. He has a 53-35 lead with Hispanics in that match up, no great surprise given Tancredo's choice of issues to beat the drum on during his time in Washington. Overall Ritter is fine. He leads Beauprez, who sounds like he's more likely be a Senate candidate anyway, 48-38 among white voters and he has a 52-38 edge over Tancredo with that demographic. Any Democrat in Colorado who wins the white vote is going to win a statewide contest in a walk. The displeasure some Hispanic voters are having with Ritter is what's driving down his numbers a little bit this month but that trend seems likely to revert to normal with time. He's still a strong favorite for reelection. Civitas has some interesting new numbers out looking at the favorability of Richard Burr and potential opponents Roy Cooper and Heath Shuler. They find that Burr's favorability is 37/10, Cooper's is 32/2, and Shuler's is 17/2. Those may seem like awfully low levels of unfavorability for the trio. The reason is that Civitas didn't provide party labels when asking voters what they think of the candidates. We do identify the candidates with their party, and it would appear that the higher levels of unfavorability we found for each of these candidates in our most recent polls (30% for Burr, 21% for Shuler, 23% for Cooper) may have been more a reaction to party labels than to the candidates themselves. -Cooper's 36% favorability rating with Republican's is higher than his 32% favorability rating with Democrats! That's a pretty remarkable finding. There's no doubt Cooper is very well respected across party lines. The question is whether he can convince enough Republicans to vote for the person instead of the party. On our poll last month 31% of Republicans approved of Cooper's job performance, much better than the 16% of Democrats who approved of Burr's performance. But Burr still led Cooper 52-35 among Republicans who held a positive opinion of Cooper. -Shuler's net favorability of +40 in the Mountains (46/6) is the best any of the three candidates have in any region of the state. Bottom line: this poll gives some confirmation of what we've been telling you since the summer. Burr has very low name recognition for someone who's been in statewide office for the last four years, to the extent that his incumbency may not be worth as much as it usually is for a sitting Senator. Now that Mel Martinez, George Voinovich, and Kit Bond have all announced they won't run for reelection I have no doubt Burr is the most endangered incumbent in the country for 2010. This has nothing to do with polling but I'm from Ann Arbor and I think it's interesting so I'm blogging about it. Somehow I never heard about this even when Bill Ayers was prominent in the news last fall, but the excellent Ann Arbor Chronicle reported yesterday that Ayers was a one time Ann Arbor School Board candidate. I got my start working in electoral politics on some highly charged and competitive Ann Arbor BOE races early in this decade so that piqued my interest. I e-mailed my dad, the reference librarian, and asked him to send me any information he could find on Ayers' candidacy. Dad reports that Ayers was one of eight candidates in the 1968 election. He finished in last place with 1,781 votes, well behind even the 7th place finisher, who received 3,606 votes. The three winners in the at large contest earned anywhere between 6,352 and 8,032 votes. I guess Ayers decided that running for the School Board was too mundane a way to achieve the change he was looking for because he started participating in bombings the next year. Apparently you can survive an election in which your opponents try to tar you with Bill Ayers...but you can't make it through one actually being Bill Ayers. Pretty much every month for the last two years we've asked voters the same question about what their top issue is. The economy has gone from being the choice of 19% of voters in the state in October 2007 to 64% in our most recent poll last week. The primary issue that has decreased as a major concern for North Carolinians in response, not surprisingly, is the war in Iraq. What I find interesting is how one major conservative issue has tanked, but the other hasn't. In October 2007 10% of voters in the state listed immigration as their biggest concern when deciding what candidates to vote for. Since then it's gone to 9% in January 2008 to 5% in May 2008 to 4% in September 2008 to 3% in January 2009. It's pretty much ceased to exist as an issue at the top of voters' lists. Think about it. When Barack Obama said last fall in North Carolina that the children of illegal immigrants should be able to attend community colleges it didn't do him a lick of political harm, even as Kay Hagan and Bev Perdue had scrambled earlier in the year to get on the 'right' side of the issue politically. While immigration has collapsed as a major issue, moral and family values are going strong as something a certain segment of voters in the state says is most important to them. In October 2007 it was tops for 13% of the electorate, it remained 13% in January 2008, saw a small dip to 12% by May of last year, and has settled in at 10% for January 2009 and September 2008. That's a much more modest decline as the economy has taken center stage. I guess for some voters having immigration as your biggest issue is a luxury that can be afforded only when the economy is relatively strong. But for the roughly tenth of the population whose overwhelming concern is God, guns, and gays that passion is recession proof. Sarah Steelman is apparently headed to Washington this week to try to round up support for a 2010 Missouri Senate bid. When you look at our poll from a couple weeks ago, she might seem like a strong candidate. Her +7 net favorability ratio was better than the other potential Republican candidates. Jim Talent's was +6 and Roy Blunt's came in at -3. The problem for Steelman, at least as far as securing the Republican nomination goes, is that her numbers are better because she does better with Democrats than Talent and Blunt do. But she's the least popular of the trio within her own party. Talent is the potential candidate viewed most favorably by Republican voters, with 78% having a positive opinion of him and 14% rating him negatively. For Blunt the breakdown is 70/17. Steelman's is 51/18. In other words, she has the most Republicans holding an unfavorable opinion of her, while her favorables run 19 points behind Blunt and 27 points behind Talent. That doesn't bode very well for her chances if she decides to make a run but can't clear the field. We found a similar trend when we tested both Steelman and Kenny Hulshof against Jay Nixon back in July. Steelman only trailed Nixon by 5 points, while Hulshof had a 10 point deficit. But if you looked deeper into the numbers, Hulshof was getting 71% of the GOP vote against Nixon while Steelman was polling at just 63%. Steelman polled better than Hulshof against Nixon because she had a stronger performance among Democrats and independents, but that obviously wasn't enough to get her out of the primary last year and our numbers indicate she could have the same problem again next year if there are multiple top tier Republican candidates. That crossover support she enjoys is nice, but she needs to win a nomination before it does much for her. A plurality of Colorado voters still don't know enough about Michael Bennet to have an opinion of him. But among those who do, he's doing alright. PPP's newest survey finds 33% of Coloradans view Bennet favorably, with 21% holding a negative view. 45% aren't sure. Very few Democrats actually seem to be unhappy with the Bennet appointment, an indication that he may not be particularly susceptible to a primary challenge next year. Only 7% of folks within his party have an unfavorable opinion of him, with 55% looking on him positively. Even with 38% unsure, an 8:1 favorability ratio with your base tends to preclude a lot of internal danger. He also gets good marks from independents, with 34% having a positive opinion of him to just 14% who don't. Bennet's primary focus over the next two years should come with two groups of voters: Hispanics and those outside the Denver metro area. 58% of Hispanics are ambivalent toward Bennet at this point, a higher percentage than in any other group and an indication he may need to prove he can represent them as well as Ken Salazar did. Similarly, while Bennet has a 40:21 favorability rating in metro Denver, he's still a blank slate to 54% of voters in the rest of the state. If he can improve his standing within those two demographics he'll be in good shape for reelection. PPP tested Bennet against four potential 2010 opponents. Two of them, John Suthers and Scott McInnis, made the poll obsolete yesterday by announcing they will not be candidates next year. Bennet led Suthers 40-34 and McInnis 43-37. In the other hypothetical matches Bennet leads Tom Tancredo 48-39 and trails former Governor Bill Owens 44-41. Still, even the Owens showing seems pretty strong for Bennet given that most voters in the state had never heard of him five weeks ago. That close match against Owens comes even as Bennet leads the Hispanic vote just 45-40 at this very early stage, a performance Bennet would likely exceed by a good deal given how that vote broke down in the 2008 election cycle in the state. The bottom line? Bennet has a lot of work to do to introduce himself to the voters of the state. But overall the state's blueward trend makes it appear he is in a strong position for reelection, and the GOP will really have to recruit a top tier challenger to knock him off. John Suthers' announcement today that he will not run for the Senate next year makes part of the poll we're going to release tomorrow obsolete. If you're interested, Michael Bennet led Suthers 40-34. Stay tuned for the rest tomorrow. We're starting monthly Virginia 2009 tracking next week. We'll just be doing Democratic primary voter polls through June and then switch over to the whole electorate after the primary. Every poll will include favorability ratings for Terry McAuliffe, Creigh Deeds, and Brian Moran as well as how they fare against each other, of course. For Lieutenant Governor the candidates I'm aware of are Pat Edmonson, Jody Wagner, Jon Bowerbank, and Rich Savage. Does that cover the announced candidates? And my understanding is that Steve Shannon now has a clear path to the nomination for Attorney General so that doesn't need to be covered on these primary voter polls. Anything else we should be asking on these Virginia Democratic polls? I think ultimately if you have to name a single reason Elizabeth Dole lost her reelection bid, it's because she was perceived as not attentive enough to North Carolina. A new PPP survey helps get to the heart of how little passion voters believe she had for the state. Only 15% of North Carolina voters think that Dole will choose to settle here now that she is no longer representing the state in the US Senate. 41% think she will live in Washington DC and 29% believe she will now make her home in Kansas, with 15% unsure. When only one out of seven voters thinks you're going to stick around in the state after your term ends, is it any wonder that Dole wasn't reelected? Even among Republicans, who presumably would have more faith in Dole's affection for North Carolina, only 23% think she will remain here. Overall 63% of Republicans, 68% of independents, and 76% of Democrats believe she will settle either in Washington or Kansas. It's a strong warning to Richard Burr and Kay Hagan not to get too afflicted by beltway fever. There's certainly a price to pay at the voting booth. Our continuing look ahead to 2010 in key states continues next week as we tackle Colorado. What do voters in the state think about Michael Bennet? How does he stack up to key Republicans? And what effect has the appointment had on Bill Ritter, his approval rating, and his prospects for reelection? Speaking of 'tackling,' we're also going to ask Broncos fans whether they agreed with firing Mike Shanahan. You can't accuse us of not covering our bases...although we won't have any numbers on whether Rockies fans are mad about the Matt Holliday trade. Ok that's a terrible pun. Unplanned. Just popped up in my stream of consciousness. There are some hints in our Ohio poll this week that Rob Portman's association with the Bush administration will give him some problems with the voters once they're more aware of the connection. We asked folks on the poll whether they thought George W. Bush or Barack Obama would prove to be a better President. Among those who said Bush would end up being better 54% said they had a favorable opinion of Portman, compared to 7% who said they viewed him unfavorably. 39% had no opinion yet. Among the respondents who said Obama would prove to be a better President the perceptions of Portman were a lot different, with 10% of those voters holding a positive impression of Portman but 37% having a dim view of him. 52% had no opinion. There's a big imbalance between Obama partisans and Bush partisans in terms of how many don't know enough about Portman to have an opinion. If Democrats can hang his association with the Bush administration around Portman's neck a lot of those folks with no opinion at this point might move into the unfavorable column- and that could quickly eliminate the initial small leads we showed Portman holding over Lee Fisher, Tim Ryan, and Jennifer Brunner. Of course how Barack Obama fares over the next two years will go a long way toward determining whether Portman's time working for George W. Bush and Democratic exploitation of the connection ends up sinking his candidacy or not. With black turnout in North Carolina likely to be down in 2010 from its lofty 2008 levels, one of the things whichever Democrat steps forward to challenge Richard Burr may need to do in order to win is get a bigger chunk of the white vote within his/her party than candidates this year did. Based on our final polls, PPP estimates that Barack Obama won the white Democratic vote in the state about 71-28, Bev Perdue won it about 72-26, and Kay Hagan took it by about a 76-21 margin. That's a lot of folks crossing over to the Republicans in each of those races. Heath Shuler isn't very well known to Democrats anywhere in the state outside the Mountains. But the way he polls with white Democrats there is a good sign if he decides to make a run for it next year. He leads Burr 68-15 with that demographic in his home region. Allocate the undecideds and that's an 82-18 edge for Shuler with white Democrats, a much better performance than any of the party's trio at the top of the ticket achieved last year. There's no guarantee that Shuler would be as well received in the rest of the state as he is at home but that's still a good sign for his prospects. We found last month that Roy Cooper has a similar strength statewide- at this point he'd likely win about 80% of the white Democratic vote. Richard Burr's challenger, whoever it ends up being, will be able to sustain a fairly signficant decline in the black percentage of the electorate if he/she can get their share of the white Democratic vote from the 70s into the 80s. At this point Cooper and Shuler's prospects for doing that are both pretty positive. When we did a poll last month just of New York Democrats on their feelings about who should be appointed to fill Hillary Clinton's Senate seat, we found that 19% had a favorable opinion of Kirsten Gillibrand and 12% saw her unfavorably, with 69% having no opinion one way or the other. It's safe to say that Gillibrand is an unknown quantity to most voters in the state. Gillibrand particularly has some work to do to up her profile in the greater New York City area. In the city itself 79% of respondents didn't know enough about her to form an opinion, with 11% of voters seeing her favorably and 10% unfavorably. It's a similar story in the suburbs where 77% of Democrats didn't know who she was and her favorables ran 12/11. Her numbers were considerably better in Upstate New York, where her Congressional district is and in media markets where her campaigns ads have run and there's been more coverage of her work in Washington, but even there 57% of Democratic voters had no opinion of her with 29% holding a positive impression and 14% viewing her negatively. She's going to have a lot of work to do in the NYC media market over the next year to build up her name recognition and image, and there's definitely some potential she could be vulnerable to a primary challenge next year from a candidate better known in that area, where a large percentage of Democratic primary votes are cast. It'll largely come down to how well she can mend any fences within the party that need mending after this appointment process, and how much positive visibility she can achieve in this first year as a Senator. Bev Perdue's getting strong marks across the board from North Carolina voters for how she's handled her transition into office. The general election contest was closer than expected because of an unusual number of Democrats crossing over to support Pat McCrory but the way she's handled the beginning of her administration seems to have overwhelmingly won over folks in her party, as she gets an 82% approval rating from them. She also has a better than 2:1 approval from independents expressing an opinion, and has a third of Republicans looking favorably upon her performance so far. Perdue was on the news pretty much every night in the Triangle during her first week of office, and that's paid off with particularly strong numbers there, where 66% of respondents approve of how she's handled the transition. It does appear she still has some work to do winning folks over on the home ground of her November opponent. In the metro Charlotte area 50% of voters approve of her transition with 37% disapproving. That net approval of +13 runs 23 points behind the statewide figure of +36. Perdue's approval is steady across demographic lines with a majority of every race, gender, and age group we track saying they approve of what she's done so far. When I decided to ask this poll question a couple weeks ago I thought it was going to come out somewhere along the lines of 25% approve, 20% disapprove, and 55% expressing no opinion. The fact that Perdue's numbers came out so much better than that is a testament both to the fact that she's come across strong and substantive during her first few weeks in office, and also that she's done a good job of being visible enough that the public at large knows what she's been up to. Often we elect strong campaigners who end up doing a poor job at governance. Perdue was surprisingly wobbly on the trail, but if she turns out to be better at governing than she was at campaigning that's probably a good deal for North Carolinians. It will be interesting to see if she can keep it up. Voinovich Retirement a Blessing in Disguise for GOP? The conventional wisdom is that George Voinovich's retirement announcement last week opened up a big opportunity for Democrats in Ohio. But our polling shows that it may have actually boosted Republican prospects for keeping the seat next year. Brunner, Fisher, and Ryan all polled better against Voinovich than they do in this initial test against Portman with the disparities ranging from four points for Fisher to 12 points for Brunner. Also, the 28% of Ohio voters who have a favorable opinion of Portman is pretty much equal to the average of 31% of Ohioans who expressed approval for Voinovich's job performance over the course of three summer polls we conducted looking at it. But the 23% of voters who have a negative opinion of Portman is considerably less than the average of 39% six months ago who said they disapproved of Voinovich's work. Basically Portman has similar positive reviews from voters with a lot who had a dim view of Voinovich currently rating themselves as unsure about Portman. Certainly the specter of an open seat creates a higher degree of certainty that one or more strong Democratic candidates will make a bid for it. But Voinovich would have been incredibly vulnerable if a decent candidate had challenged him, and the Republicans may end up being better off in 2010 with a fresher face as their nominee than the incumbent. Our polling in Missouri last week similarly found that the difference between incumbent Kit Bond and a trio of possible new Republican candidates pitted against Robin Carnahan was not that great, and although we haven't done any polling in Florida yet since Mel Martinez retired, his numbers over the summer were so bad that it's hard to imagine the open seat not improving GOP retention prospects. It is undeniably bad news for Republicans that Democrats have a good chance to pick up these open seats in Florida, Missouri, and Ohio. But if anything it's possible their ability to hold these seats has been helped rather than hindered by incumbent retirements. Few of us expected to see an African American in the White House during our life times...but it's beginning to look like the more long shot occurrence is a Clemson basketball victory in Chapel Hill. I was talking about this with a friend last night. We elected a black President on our 56th try. The Tigers are now 0 for 54 after getting demolished in the Dean Dome last night. So if they don't win in one of their next two trips, it will have taken more opportunities for Clemson to win at UNC than it took for our country to elect a President who wasn't a white male. I'm not sure you can statistically calculate the odds of it taking fewer shots to put a black man in the White House than for an average ACC program to win just one game at the class of the ACC's home gym, but this is one thing I'm pretty confident of: if you'd asked any North Carolinian in the 1920s, when the Clemson streak started, whether North Carolina would vote for a black guy for President first or whether the Tar Heels would take one on the chin at home against the Tigers, I'm pretty sure you know the answer. It's remarkable on both fronts. Ted Strickland would start out with the lead if John Kasich were to challenge him for Governor of Ohio in 2010, but it's certainly not an insurmountable advantage. Strickland's approval rating is 48/35. In June we found it at 47/26, so while his approval has pretty much remained static over the last seven months, a number of people have moved from the 'no opinion' to the 'disapprove' column during that time. A 42% plurality of voters in the state don't know enough about Kasich to have an opinion of him one way or the other. Among those who do, 34% see him favorably and 24% have an unfavorable perception of him. One piece of good news for Strickland is that he leads Kasich 44-41 among white voters. The reason he only has a six point advantage overall is that the poll found him only winning 52-29 among black voters. Polling a long ways out from an election tends to underestimate black support for Democratic candidates but it seems likely Strickland will at least match the 77% he got against his African American opponent, Ken Blackwell, in 2006 or exceed it. Any Ohio Democrat who wins the white vote will win a contest for statewide office. Nevertheless if Kasich decides to make the race this will be one to watch. Our newest poll finds Congressman Heath Shuler trailing Richard Burr 39-28 in a hypothetical match up. You might wonder how that compares to similar polling we did two years ago against Elizabeth Dole. We tested two Democratic members of the Congressional delegation, and found Brad Miller trailing Dole by 11 points and Bob Etheridge trailing her by 15. So Shuler's intitial performance against Burr is comparable to how Congressmen did at this stage against Dole, who of course ended up losing. And Shuler's doing much better than Kay Hagan did in early testing two years ago. When we first looked at how she stacked up to Dole, she trailed by 16 points. Richard Burr's approval rating continues to languish in the 30s, the newest survey from Public Policy Polling finds. Even as he enters his fifth year representing North Carolina in the Senate, a 37% plurality of the state's voters continue to have no opinion of him one way or the other. By comparison, former Senator Elizabeth Dole had a 44% approval rating in January 2008. Congressman Heath Shuler, one of the Democrats being most commonly discussed as a potential Burr opponent, is an unknown commodity to 58% of voters in the state, with 21% holding a favorable opinion of him and 21% viewing him unfavorably. Interestingly though Shuler's popularity in the Mountains, which he represents in Congress, is higher than Burr's approval in any individual region of the state. 51% of voters there have a favorable opinion of him. Burr doesn't have higher than a 41% approval rating in any individual section of the state. The fact that those who know Shuler think so highly of him bodes well for his prospects as a candidate if he decides to enter the race and start building up a statewide profile. In a preliminary head to head match up Burr leads Shuler 39-28. This lead is largely a product of two times more Democrats saying they're undecided than Republicans. While 38% of Democrats aren't sure who they would support at this preliminary stage, only 19% of Republicans are. A PPP survey last month found Burr trailing Roy Cooper 39-34. Polling under 40% against two potential 2010 opponents is not a good sign for his reelection prospects. I am baffled by what's going on (perhaps not going on is a better description) with the race for chair of the NCDP. Pretty much everyone I know doesn't think any of the named candidates are suitable replacements for Jerry Meek. They all have done good service to the Democratic Party and have a role to play, but none of them have shown the fundraising ability needed to keep the party running strong. As I wrote last month, the new chair needs to be someone both with a strong commitment to the grassroots and the ability to keep the coffers flowing. Having one of those skills or the other isn't going to cut it. Although Bev Perdue has done a great job during her early days in office (we'll have some polling showing the public agrees later in the week), I am baffled by her lack of leadership on this. Under the Dome has reported that she may not take a side. She not only needs to take a side, she needs to recruit a strong candidate to run with her support. Even though the election is only ten days away the complete lack of clarity about who's running and who's not has made it entirely possible that someone could get in the race with just a week's notice and win. I don't get the sense that any of the folks who have thrown their hats in the ring have locked up a lot of support. Maybe she knows what she's doing and is just holding her cards close because the lack of strong candidates makes it so that she can afford to wait. I certainly hope so. As our report last week showed, keeping the Obama coalition engaged is going to be critical to Democratic success in 2010, and having a plan and the money to execute it could play a real role in the ability to defeat Richard Burr and maintain a Democratic legislature next year. Barack Obama may have taken North Carolina by the smallest of margins in November, but PPP's newest survey finds that he's won over a lot of voters in the state in the subsequent 11 weeks. He receives a 66% approval rating for his transition, with just 25% disapproving. The support for his work in preparing to take office is universal across demographic lines: voters within every gender, race, and age category that we track give him at least 60% approval. That's particularly notable with white North Carolinians. Only a little more than a third of them gave Obama their votes, but 61% give their approval to his transition. Although there has been some consternation from the liberal wing of the party about some of Obama's decisions in the last couple months, a remarkable 89% of Democrats approve of the transition. It's hard to get 89% of Democrats to agree on what color the sky is. Voters most concerned about health care, education, and the economy give Obama his overall highest marks. -John McCain led Barack Obama 52-38. McCain was winning a full 30% of the Democratic vote and even black voters weren't completely behind Obama- he was earning 73% of their support. Young voters in the state hadn't gotten enthusiastic about Obama yet either. He had a narrow 47-44 edge over McCain with that demogrpahic. -Elizabeth Dole led Kay Hagan 48-35. Hagan was only getting 59% of the Democratic vote, and Dole even led her 44-37 among voters most concerned about the economy. -Speaking of the economy, just 39% of North Carolinians named it as their top issue. The war in Iraq was at 22% and immigration was still pulling 9%. By the end of the year the economy was up to 60%, the war was down to 9% and immigration was only a main concern for 3% of the population. One thing that didn't change: Bev Perdue led Pat McCrory 41-39 in mid-January, and that ended up being almost identical to her final winning margin. Guess the undecideds broke evenly! A new PPP survey of Ohio voters finds that the most discussed possible 2010 Senate candidates in the state aren't particularly well known. 49% of respondents have no opinion one way or the other about Republican front runner Rob Portman. 46% are ambivalent toward Congressman Tim Ryan and the figures are 31% and 28% respectively for statewide Democrats Jennifer Brunner and Lee Fisher. Fisher gets the best overall marks, with 40% of voters having a favorable opinion compared to 32% who see him negatively. Portman's numbers are 28/23, Brunner's are 34/36, and Ryan's are 26/27. None of the candidates appear to have much bipartisan support. Only 13% of Democrats have a favorable opinion of Portman and 13% of Republicans have a positive view of Fisher. There's even less cross party respect for Brunner and Ryan, at 9% and 8% respectively. Portman leads potential match ups with all three of the Democrats. It's a 41-39 edge over Fisher, a 40-34 advantage over Ryan, and a 42-34 lead on Brunner. Those numbers are largely a reflection of the GOP seemingly already unifying around Portman for the 2010 nomination. For instance against Brunner he gets 80% of the Republican vote while she gets just 59% of the Democratic tally. It's a similar story against the other two. Fisher gets just 68% of the Democratic vote and Ryan gets 60% compared to 80% and 74% respectively among Republicans for Portman against those two. It's safe to say those numbers would go up for any of the Democrats were they to become the nominee. The bottom line is that none of these candidates are going to come right out of the box and light the world on fire. It's likely to be a closely contested race, with no clear early favorites. -In Ohio we're going to look at how Rob Portman stacks up with Jennifer Brunner, Tim Ryan, and Lee Fisher. We'll also poll a possible Ted Strickland-John Kasich contest, and look at how voters in the state are looking at Barack Obama and George W. Bush as the change in power comes near. -In North Carolina we'll continue our monthly look at the US Senate race, seeing how Heath Shuler would stack up to Richard Burr. We're also going to look at how Bev Perdue's early days are playing with the public, take a final look at Mike Easley and Elizabeth Dole, and see how North Carolinians think the Obama transition has gone. Should be some interesting stuff. Did the Bond retirement matter? There's no doubt it's easier to win an open Senate seat than to knock off an incumbent. But if you take a deeper look at the numbers from our Missouri poll this week, and compare them to how Robin Carnahan was polling against Kit Bond before he announced his retirement, I'm not sure it really makes that big of a difference. When we polled Carnahan against Bond in July, she trailed him by two points. When Daily Kos did it in December, she had a four point deficit. Both of those results were within the margin of error, as were the numbers we got when we pitted Carnahan against Roy Blunt and Jim Talent last weekend. When you look at the approval/favorability ratings for Bond pre-retirement and compare them particularly to Talent, there's not a big difference. In July we found Bond at a +6 net approval, in August it was +1, and in December Kos put it at +6. Average them and that's +4 for Bond. By comparison our poll this week found that Talent, with a similar level of name recognition, is at +6. The less well known Sarah Steelman is at +7. Only Blunt has a significantly worse favorability mark, at -3. So really, it appears that if Jim Talent or even Roy Blunt were to end up as the Republican nominee they would start in a relatively similar position to where Bond would have been. The retirement is good news for Democrats in the sense that someone like a Robin Carnahan might be more likely to put her hat in the ring now that it's an open seat, but ultimately what I think would have been a highly competitive and close race in 2010 will still be a highly competitive and close race in 2010- just with a different cast of characters. Our Missouri poll this week found that Roy Blunt received a net negative favorability rating from voters in the state. The biggest reason is his unusual level of enmity from independent voters. 33% of them see Robin Carnahan unfavorably, 32% have a dim view of Jim Talent, and 18% dislike Sarah Steelman. A much greater number, 42%, have a negative opinion of Blunt. There's one obvious reason for this. After years spent in the Republican House leadership, Blunt has a reputation as a partisan warrior that might not appeal to voters who don't identify with either party. He may have another liability with those independent voters though- his son. Overall 50% of voters in the state we surveyed say they think Jay Nixon will make a better Governor than Matt Blunt. But among the independents who have a negative view of Roy Blunt that gap is much wider, with 74% thinking Nixon will be better while just 10% choose the younger Blunt. Matt Blunt didn't leave office with much popularity, and that may prove to be an issue Roy Blunt has to deal with if he jumps into the field. -For the most part I would consider a potentially competitive Congressional district to be one where the Presidential contest is closer than ten points. For North Carolina that means the 7th district (McIntyre), 11th district (Shuler), 2nd district (Etheridge), 9th district (Myrick), and 8th district (Kissell.) I don't see the other eight Congressional districts as being remotely competitive under the current map. McIntyre and Etheridge have become so entrenched as to be unbeatable, but their districts would be competitive if they retired or ran for another office. Shuler's seems likely to reach that status quickly if he doesn't decide to run for higher office. The sleeper here is Myrick's district. Democrats ran valiant campaigns for Congressional seats in the 5th and 10th districts, but those two are so Republican as to be nearly impossible. The 9th district is a long shot, but more potentially competitive than any other currently Republican held seat, particularly if Myrick were to retire. If Democrats want to make a run at picking up another seat, this is the place to recruit a strong challenger. -The three districts where voters are most clearly picking the person rather than the party when it comes to their representative in Congress are McIntyre's 7th, Etheridge's 2nd, and Shuler's 11th. All three of those seats would be highly susceptible to party change if they came open, and that's why if North Carolina gets a 14th Congressional seat, legislative Democrats drawing up the new lines need to really consider whether they want to try to carve out a new Democratic district, or move some folks around to make this trio of districts more safely Democratic in an open seat situation.